Passing the Nevada written exam has never been easier. It's like having the answers before you take the test. Pass a vision exam, written knowledge test, and driving test (if you've never been licensed before). Prove your identity and NV address. Ready to get behind the wheel and out onto Nevada's open roads? Then we're ready to walk you through the process. 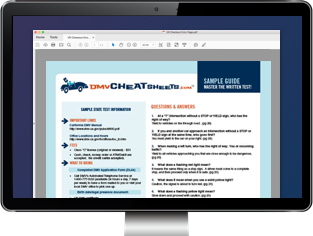 Continue reading this page to learn how to apply for a driver's license from the Nevada Department of Motor Vehicles (DMV). If you're younger than 18 years old, please follow the instructions on our Applying for a Teen License page. f you need a commercial driver's license, see our Applying for a New CDL page. The Nevada DMV issues federally-compliant REAL ID driver’s licenses in addition to standard driver’s licenses, which allow you to use your license for domestic travel and entry into federal and military buildings. You can choose to apply for either type of credential—the documentation needed to obtain each differs slightly. Details are below. If you're new to Nevada, you must transfer your out-of-state driver's license within 30 days of becoming a resident. During this process, you’ll also have the option to upgrade your license to one that is REAL ID-compliant—see the Apply for a Driver’s License section for more details. NOTE: You do not need to obtain a NV driver's license if you are only temporarily in the state (i.e., visitors, students). Submit a completed Application for Driving Privileges or ID Card (Form DMV 002). Nevada residency (2 documents), certified or originals dated within the last 60 days. Surrender your current out-of-state driver's license or ID card. Pass the written knowledge exam (under 21 years old or if required). See the NV DMV website for more information. If you have a driver's license from another country or U.S. territory, you must also pass an on-road driving test. The NV DMV will mail you your driver's license within 10 days. You will receive a temporary driver's license to use while you wait. Non-commercial: Class A, B, and C.
Can be used for most identification purposes, but will NOT be allowed as proof of ID for domestic travel or entry into military or federal buildings past 2020. These licenses may be used as identification when boarding domestic flights or entering federal facilities. Cannot be used for identification purposes. Residency (2 documents)—must be certified or original documents dated within the last 60 days. Depending on the documents you present as proof of your identity and residency, you will receive either a standard license, REAL ID license, or Driver Authorization Card. Complete an Application for Driving Privileges or ID Card (Form DMV 002). Check the box on the form that reads "Real ID" to apply for a Nevada REAL ID license. Once you've passed your driving test, your driver's license will be mailed to you within 10 days. Before you will be issued a driver's license, you must pass both a written test and driving test. Details for each of these are below. You will be given 25 questions (multiple choice) as part of the written test. To pass, you must get at least 80% correct. You will need to provide your own properly registered and insured vehicle for your road skills exam. It doesn't have to be registered in your name, but it must not be a rental car. Use your signals properly when approaching a turn. Stop and start your vehicle. Drive up and down a hill. NOTE: Driving tests are not offered at all NV DMV office locations. The fee for your driver's license will depend on your age and length of validity of your card. Your card may be valid for 8 years or 4 years.